Peering into the gaming PC's gargantuan case, the system's creator flicked away a spec of dust. "When the customer said they wanted this colour," he begins, pointing to a water-cooling reservoir radiating an atomic yellow hue, "I thought it would look awful — but it's turned out really well." 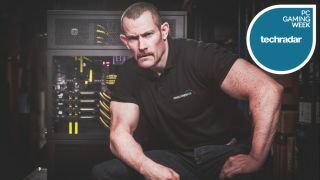 Talking TechRadar through the rig, a near £10,000 (around $14,900) dream machine called the Supernova, is Ian "8pack" Parry. A veritable T100 in a polo top sporting a thick Huddersfield, England accent, Parry is the creator of Overlockers UK's flagship 8pack gaming PC range. Ranked number one in the world until recently (and still number one in the UK) by authoritative benchmark score collator HWBOT, he is also one of the top overclockers on the planet. The culmination of Parry's 15 years of system building and overclocking experience, the Supernova sits at the top of the 8pack range and can take anything from two weeks to a month to build depending on a customer's requirements. "The majority of customers who buy one are gamers, but some are using it for rendering or high-level encoding," Parry explains. "It's normally processor and graphics card-intensive activities like running Photoshop and other multimedia applications at the same time, in addition to multi-monitor setups, which require serious power." A glance at the Supernova's spec sheet reveals a number of high-end components. They include an Intel Core i7 5960X CPU clocked at a minimum of 4.6GHz, an Asus Rampage V Extreme X99 motherboard, four Nvidia GeForce GTX 980 4096MB GDDR5 graphics cards configured in Quad-SLI and 16GB of DDR4 3200MHz RAM. Due to the power of the hardware, Overclockers approached Super Flower to create a custom 2000W PSU, which is 8pack-branded to match the machine. "The ethos behind the 8pack systems is that there's no stone unturned," Parry says. "Nothing's too expensive, it just has to be the best. We test all components and pick out the best to suit a specific form factor or motherboard configuration. "A Supernova can be highly customised to have a crazy paint job, different etching on the window or different types of grills. It would never be built with anything less than three or four GPUs, but nothing is really out of the question so long as we have it in and the customer will wait for it to be done." It's a laborious process, but testing components individually is essential due to the inconsistent quality of yields, Parry explains. While finding a slightly under-performing CPU would have a negligible effect in a budget PC, it could have a serious impact on a Supernova being the best machine it could possibly be. "When you're using three or four graphics cards, you need the bandwidth on the CPU, and the best CPU in terms of threads and cores is Intel's X CPU," he says. "That's why we buy many of them and bin until we find very good ones for these systems — typically the top 10%." Parry, a former enthusiast bodybuilder who traded lifting for overclocking, joined Overclockers in 2013 after being asked to launch the 8pack range. Though seemingly disparate, he maintains that there are similarities between his current and former profession. "Both take things to the extremes, and I like to be at the top and take things as far as possible," he says. "The mentality toward improving your system when overclocking is very similar in how you improve the physique. It's about the mind and tuning it to see a project through. "An example of that is when you're bodybuilding to get body fat down as low as possible by tweaking diet and training. It's the same as trying to improve the scores on benchmarks. It's what we call efficiency training. "It's similar to doing a few memory timings to help with the benchmark score, that kind of thing. You're looking at really minor details to get the maximum possible gains." In addition to running games, Parry runs a number of different benchmark tools to check that a system is running optimally — including Intel XTU and Prime for CPU and memory, 3DMark for extreme benchmarking at 4K resolutions, along with Unigine Heaven and Unigine Valley for 3D benchmarking. Others include Cinebench and Handbreak to check encoding, alongside "the "meatiest and standard DOS environment programs", which are used to give a "pure" benchmark score by removing the operating system from the process.